Gone are the days when knitting was all about making monotonous patterns. Today is the age of vibrant and multifarious knit patterns. Knitting truly is conquering new heights with the rise in the number of knitting patterns. In fact, one can create his/her own knitting patterns by applying creativity and imagination. One can combine knits and purls in an array of ways to form unique knitting patterns. In case of two stitches, the former stitch is called the knit stitch whereas the latter one is called the purl stitch. Both these stitches create a unique effect whereby a particular stitch appears to be a purl stitch from one side of the fabric and a knit stitch from its other side. The different visual effects created by the knit and purl stitches help in creating several types of designs and patterns. Knit stitches generally look like ‘V’s stacked vertically. Purl stitches look like wavy horizontal lines running across the fabric. Rows of long and short stitches can be created to form interesting knitting patterns. They create an appealing visual effect. Stockinettes are simple fabrics in which all the stitches are either the knit stitches or the purl stitches. Both these stitches are twisted to create unique design patterns. Right and left plaited stitches create beautiful visual effects. One can knit attractive patterns of jewelry from fine wires of metal by using plaited stitches. The different types of purls and knits include box stitch, basket weave, garter stitch, moss diamonds, moss panels, rice stitch, seed stitch, parallelograms, windmill, mistake rib, twin rib, triangle squares, triangle ribs, single chevron, close checks, elongated chevron, pavilion, purled ladder, weave, pique triangles etc. All these create interesting 2D and 3D effects on the fabric. Interesting knitting patterns can be created through several types of stitches. The various types of knitting used for creating beautiful types of patterns include shadow knitting, slip-stitch knitting, fair-isle knitting, drop-stitch knitting, cable knitting, lace knitting, bias knitting etc. 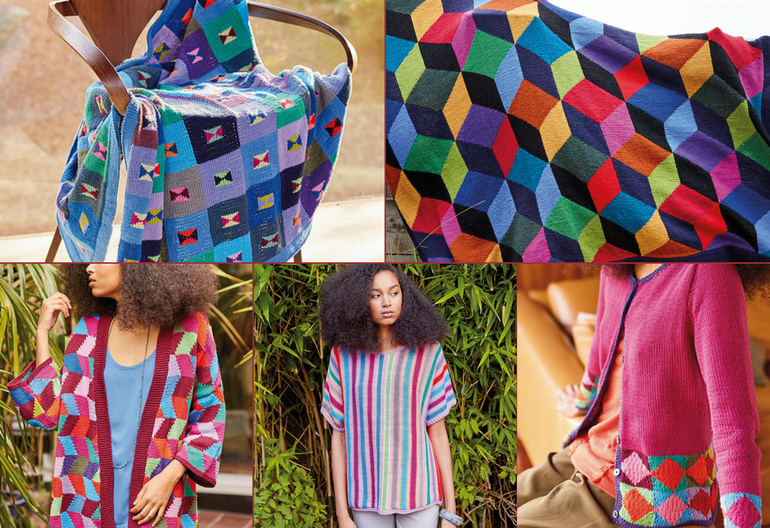 All these types make use of purls, knits and wales to create a variety of design patterns. Each pattern of stitch can be created keeping in mind the stitch multiples required for that particular pattern. A multiple of 7 means that one can cast on a certain number of stitches that are divisible by 7. A multiple of 9+2 stitches means that one can cast a certain number of stitches that are divisible by 9 along with two extra stitches. Reversible stitch patterns are of two types. In the first reversible pattern, the stitches on the cloth look similar on both its sides. The stitches on the fabric look different when seen from its both sides in the second reversible pattern. These visual effects add interesting dimensions to the fabric. The different types of reversible stitch patterns include layette, diagonal rib, little pyramids, purled ladder, moss stitch, diamonds etc. Several websites provide information about knitting patterns with beautiful illustrations and step-by-step guides. One can also avail the books and magazines on designs and patterns. Be it a cute teddy bear or a chic shawl; cozy little mittens or smart cardigans, one can incorporate interesting knitting patterns to add that extra style to the stuff he knits.